Hi. Past 9:30. How are you? I tend to have my shower and shave moments at night, so that I can sleep in a few extra minutes in the morning. I've got into that habit in recent years. Maybe it's a bad one. I am not sure. But it is not the bad habit to which I refer in the post's subject. The bad habit is likely the way I have been shaving for the past quite a few years. Ever since I started using those really expensive multi blades like the Gillette Pro Fusion Ultra Awesome Yippee, I have been shaving my face pretty much any way I wanted to. There didn't seem to be a wrong way to do it. Up. Down. Left. Right. Sideways. 72 degree angle. Didn't matter. Since I have gone back to the old school way of shaving, with the simple razor blades my father used when I was little, I have had some problems getting a close shave. I figured I was not pressing hard enough. I pressed harder, which increased the risk of cutting myself. That didn't solve the problem. I typically shaved up and down and didn't go against the grain. I continued this process with the razor blades. One night, it took me 40 minutes to get a close enough shave to make me happy. I could even then feel stubble when I "rubbed" up on my face, so my happy feelings didn't last long. I was wondering if I had made a mistake going back to the old-fashioned razors. Maybe I should go back to the Gillette Blah Blah Blah's. I hate to admit defeat. I am the kind of Bevboy who, when offered a jar of pickles to open, will grab that sucker and twist and turn and beg and plead and bargain with that jar until it opens. I'll run the jar under hot water, tap on the lid with a butter knife, use one of those plastic things to enhance my grip. I don't care. Doesn't matter if I end up ruptured or if I have injured my wrist in the bargain. I don't easily give up. So, I was inclined to keep trying to get a good shave with these old-fashioned razor blades. Tuesday night, after my shower, I grabbed the razor and regarded it with an admixture of fear and contempt. "I am coming for you. You are mine. Shave me, Seymour!" I applied the shaving soap to my face. Out of instinct more than anything else, I decided to shave with a lighter hand, and moved the razor back and forth, from left to right, on the left side of my face. I "heard" the whiskers coming off. I felt my face. They were gone. I continued shaving in this manner until the left side of my face felt as smooth as... well, you supply a nice and clean example of something that's smooth and we'll go along with it. I shaved from ear to mouth on the right side of my face. Once again, the whiskers were no match for the razor. I was done with my shave in barely 5 minutes. Tonight, though, in repeating the process, I perhaps pressed a titch too hard on the razor, for I cut myself here and there. For the first time in many a year, I knicked the mole on my cheek. Those things can ooze blood for hours. I applied my styptic pencil to the area, and now all is well. I think, then, that is the best approach. Shave from ear to mouth on each side of my face. Apply a lighter pressure. And brag to everyone that I am still using the same blade from 4 weeks ago, and that I have 4 more to go, and that these were the blades that came with the damn razor in the first place. Guys, when you shave, assuming you don't use an electric razor, what is your "method"? Up and down? Side to side? What? All of a sudden this topic is fascinating to me. A guy subject, on Bevboy's Blog. I love it. I didn't write last night because my body pretty much shut down right after The Flash was over. My goodness, that show gets better every week. I never was that into Arrow. "DC's Legends of Tomorrow" nearly put me to sleep half way through the pilot episode. "Supergirl" is super dull. But "The Flash" just zips right along. I love it. We had a very good Toastmasters meeting tonight. We had 9 members and 4 guests, a very good turnout. I did table topics, which is where you make up a 2 minute speech on the spot, with little or no preparation time. What I did tonight was take a Costco bag full of books here at the house, books I no longer wanted, and got participants to grab a book from the bag and do an instant book report. The understanding was that they hadn't read the books and had to improvise a book report to give us the impression that they had read it. And I also told them that they could keep the books in question. AFAIK, the only one who took a book home was a guest, who decided to keep a book with "Toastmasters" in the title. The book has as much to do with the organization as kittens baked in the oven at 350 for 30 minutes have to do with biscuits. It uses "Toastmasters" in the generic sense, like "Joe was the Toastmaster at the banquet: he had to keep the meeting going from one person to the next, and that sort of thing." I probably should look into this, but I have wondered for a long time whether this use of "Toastmaster" precedes the organization, which was founded by Ralph Smedley in 1924. If it came after the founding of TM, then I am guessing that the organization could sue other organizations that called the person who runs the meeting portion of a banquet a "Toastmaster". I need to research this. And I know you don't care, so never you mind. 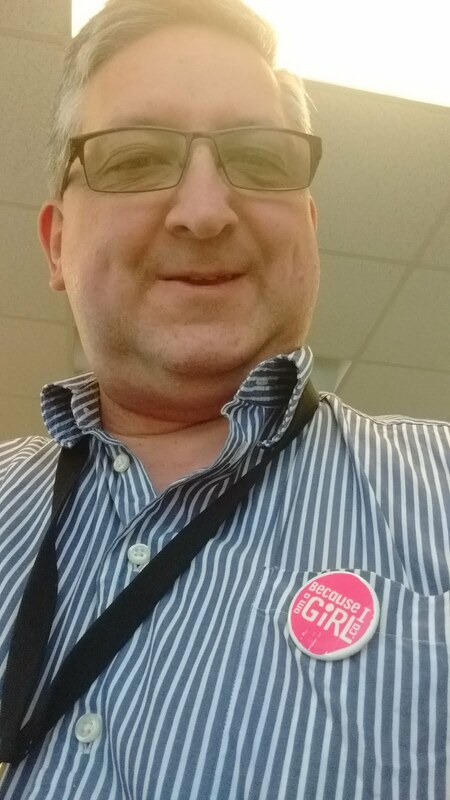 I have been in TM for nearly 25 years. Nobody who is in a position of authority gives a flying frigmuffin about this, but I know quite a bit about how to run an effective meeting, how to make parliamentary motions, and so on. It is a good skill to have, and an awful lot of people who think they know this stuff, just plain don't. But they're at a higher pay grade than I am, so I say nothing. Anyway, long day, and another one beckons. Think I will turn in. The end of another, action-filled, rich-with-incident, Easter long weekend is behind us. I return to work tomorrow with renewed vigor. Yep. You know it. Actually, I slept in again this morning, because I could. And, also because I could, when I got up, I prepared a breakfast for us of steak and eggs with hash browns and coffee. Crazy filling. That meant that the huge turkey that was put in the oven after lunch time will serve as our dinner on Tuesday, when we get home from work. After lunch, we wanted to watch an episode of Mr. Robot through my Plex media server, but it wouldn't load. Just sat there, spinning around and around. I came down here to check things out and nothing was loading on this computer. I don't know what caused the problem, but I spent the next two hours trying to get this damned computer to re-boot properly. I could get it to boot to Windows 7 with no problem, but I could only get it to back to Linux Mint via recovery mode. Even then, I ended up with a wonky screen resolution, which hours later I have only partially fixed. Getting PMS to work again, nearly gave me a case of PMS, if you catch my drift. The library content I had wasn't available to me. I remembered an obscure page I had googled months before. It involved having to edit a Plex configuration file, and changing one value to another. Took me a while to find what that file was. I remembered what the value was, though. Once I saved that change, and restarted Plex, my content was there again. And I have saved that page to my HTPC folder on my bookmarks. Plex has been working fine ever since. We watched a couple episodes of season 2 of "Mozart in the Jungle" this evening. I have been working with computers for the better part of 35 years now. As a couple people at my work point out to me over and over, I am not as smart as they are, but I am nonetheless not as stupid as they seem to think I am, either. I was able to figure out what the problem was, even though it took me a while to get there. Of course, they not only would know what the problem was before I did, but would have written an update to the operating system preventing that problem from occurring in the first place. Using only one finger on one hand to type it in, naturally. My point is, while I was able to figure this out, there are an awful lot of people who would have screamed and hollered and just plain given up. Computers are not as easy to use as those other folks need them to be. They've come a long way, but have another long way to go. We watched some episodes of Mr. Robot today. I got Patricia interested in the show. It's about a young man who has some kind of social anxiety disorder, who works for as a system administrator for a company that provides that provides security for larger companies. He's recruited by white hat hackers to work for them to bring down even larger companies. Meanwhile, one of those targeted companies recruits the young man, too. Say, let's make this about me. I was recruited for a summer job at Burger King when I was a student. I know where this guy is coming from. Ha! I had a lovely shower and a shave tonight. I am getting the hang of that razor. That is to say, I didn't cut myself to ribbons. I don't know where long weekends go. They go by far too quickly. Tomorrow, I have promised to cook steak and eggs for breakfast. And for dinner, we will have a turkey. Newbie is all over me to turn in. He is giving me those puppy-dog kitty eyes, and I cannot resist him. That means I must go. I type these words in my home office, at my so-called backup desktop computer. I replaced the media server a month ago. It has more than enough oomph to let me write blog posts at the same time it's transcoding movies and tv shows, or streaming music. The previous one all but blew up on me, taking some hard drives with it. At any rate, this other computer is one I have had for 7 years now, and while it only has 2 gb of ram, still runs plenty fast for my purposes. Like you care, of course. I know you don't. We spent the day not doing that much. We watched some stuff on the PVR. Tonight I threw out some chicken carcasss pieces from last week. It had been in the roaster, in the oven, since last weekend. I do not need to describe the horrors that awaited me when I took the roaster out and opened it. The roaster has hot water and dish detergent in it now, and will soak over night, and into the morning. Gross. Tonight we watched the last two episodes, probably forever, of "Second Chance", the latest iteration of the Frankenstein story, broadcast on Fox TV. The show didn't have a chance. It went through two title changes before broadcast. Its episode count was reduced from 13 to 11, once again before a single episode hit the air. And it was moved from Wednesday night to Friday night after two episodes were broadcast. Its new home was Friday night at 9pm ET, a time when other channels are running lame-o reality shows or situation comedies devoid of humor. None of these things bodes well for a successful program, especially one with such a high concept as this one. It's about an old man, a retired sheriff driven from office because of scandal, who is murdered by some bad guys, but brought back to life by scientific means for reasons that drove the plot. There are a couple of twins, who speak their own silly language because it employs some people who write sub titles. The female twin is dying of a cancer that only this revived man can fix, because of his unique blood strain. The male twin doesn't get along well with others at all. He has no social skills. Picture me, back when I was single, and you get a pretty good idea of what he was like. As a result of this process, the old man is now 35 years old and smokin' hot. The process that revived him has made him super strong, and he can beat people's heads in with the best of them. The process that brought him back also means that he must be submerged in a special chemical bath every 24 hours for an undisclosed period of time. He floats in this big ol' tub, his willy discretely out of view, because this is on a broadcast network. Despite the silly concept, and the things that don't need to be there, that get in the way of the story telling, this was a fun show, over all. The banter between the old-young man and his son, is often priceless. The son is played by Tom DeKay, best known for playing an FBI agent on "White Collar" for years. How does he follow that character? By playing an FBI agent on this show! For 9 episodes, the father and son team solved crimes, met bad guys, and bantered. It was more fun than it had a right to be. Then, we had the last two episodes, the ones we watched this evening. They were everything the show should have been, all along. If it comes back, which I think is a big if, then the producers have streamlined the show, getting rid of many of the things that I found annoying, and have a more-or-less clean slate. I will be there if it is. Does "Second Chance", deserve one? Yes. It does. Here are a couple of articles about the show. Well, I wish I could say that I tackled all the things on the list I provided yesterday, but I didn't. I did make a lovely fish dinner tonight. Apparently, the places that sell fish and chips make out like gangbusters on Good Friday. John's Lunch in Dartmouth was crazy busy. And Fredie's Fish and Chips was busy, too. I presume other places that cater to those who like their fish fried in oil were busy, too. This time, I used a different kind of flour. It had flax seed in it, and had a different texture than the gluten-free stuff I used recently. We both preferred the finished product. We finished the evening binge watching the first 6 episodes of 11.22.63. It's based on a very long Stephen King novel that would have been much longer had Stephen King had his way. Instead, his editor cut hundreds of pages from the thing, so look for a special edition of 11.22.63 in ten years or so. It's about an English teacher in the present day who goes back in time to try to prevent the assassination of JFK. I hope that the book doesn't have the plot holes and coincidences that the tv show has. Just when Jake is about to do something that he went back in time to do, something else comes up that demands his attention. He goes off and does that thing and messes up his big plan. Happens over and over. Sloppy story telling. Say what you will about Stephen King: he's windy, his books meander too much, what have you. He at least knows better than to use these feeble plot devices to keep the story going. Still a good show, though. There are only 2 episodes left, and we will watch them. Tomorrow, let's try and tackle some of the things I listed on Thursday. K? Post 3219 - The Weekend Is Here! Yay! I am on the cusp of a 4 day weekend. f. Maybe watch some episodes of 11.22.63. Yeah. Awesome weekend coming up. One more work day left in my week, before a 4 day weekend. How lucky am I! I mean, I KNOW that lots of other people get this same 4 day weekend. I am not the only person so blessed. But this is my blog, and it's about me, and not about you. So, I get a 4 day weekend starting in less than 24 hours. Yay! You can tell that this is going to be a boring blog post when the highlight of my day was receiving the bars of shaving soap that I ordered several weeks ago, through Amazon. It is the Williams Mug Shaving Soap, which costs less than two dollars for each "puck". I decided to stock up and got 6 of them. For those men out there, who shave: Have you noticed that the stores all seem to stock the crazy-arse expensive multiblade cartridges? The ones you have to put a second mortgage on your home to purchase? It is deuced difficult even to find the simple razor blades that my safety razor needs. That's fine, for now. When I got the thing earlier this month, it came with 5 blades, and I am still using the first one, so I have 4 more waiting for me. But the day will come when I will have to get new blades, and there are not that many places that stock them. The Lawton's at the Halifax Shopping Centre had a 5 pack of them for about 5 dollars. Not a bad price, I guess, compared to the multi blade cartridges I am trying to eschew. But I am sure that if you can buy a 10 pack, or a 20 pack, of these blades, that I can realize greater savings. I guess it means having to look on Amazon. I'd like to support local, but if they make it impossible for me, then I will have no choice but to look elsewhere. A friend tells me that Sievert's Tobacco in the downtown has some of those razor blades. I don't work downtown any more, but perhaps when Patricia is feeling better she can look there for me. 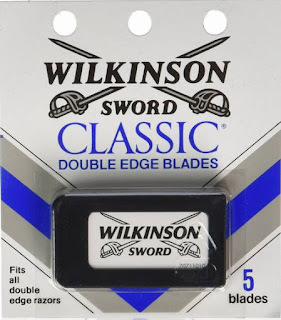 How weird it is that a fella can't find the very blades that used to be ubiquitous? Anyway, I think I will turn in. Been a long day. Need my beauty coma. Sorry I didn't write last night. 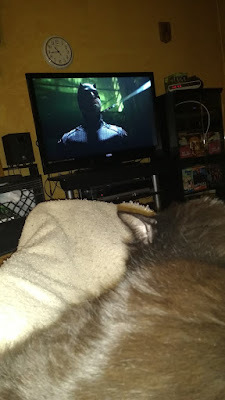 I had been up until midnight Sunday watching season two of "Daredevil". Loved it, but I didn't love having to get up at 5:30 Monday morning and heading off to work earlier than usual, because I had to drop off my car at the shop. They fixed what I asked them to, but they also uncovered $2000 in other work that should be done in the soon future. Sigh, and double sigh. Anyway, I got home last night, and I was still tired from having been up late the night before, and from the news about my car. By 7:20, I had to lie down "for a minute". I ended up being down for the entire evening. No blog post. This evening, when I got home, I checked my mail and much to my delight, some back issues of Ellery Queen's Mystery Magazine, as well as issues of Alfred Hitchcock's Mystery Magazine, arrived. Special deal from the publisher. I think I have another set of these back issues waiting for me at the post office. I will find out after work. Among the treasures is the September 2011 issue of AHMM. It contains a Jas. R. Petrin story featuring Skig Skorzeny, the Halifax-based loan shark with a heart of gold that Petrin has been writing about for 10 years now. The Skorzeny stories so far are my favourites ones by Petrin. Halifax is as much a character in these stories as Skig is. I recently read a story by Petrin called "The KA", which is about a middle-aged couple who bickers all the time who ends up with a corpse in the backseat of their falling-apart car. The body is in a burlap sack, which is great, because they are highjacked by a guy with a gun who's looking for the guy in the sack, thinking him to be still alive. It's pretty funny, actually, if you have a certain sense of humor about the absurd. At one point, the couple decides to ditch the corpse, which really pisses of the man with the gun. He insists they get the bag and its contents back in the car, because he hates littering! A gunman with an environmental streak. Probably a first. In the last couple of days I read yet another story by Petrin called "The Potentate", featuring an old man named Cab Sogurdsson (I will have to check the spelling because I don't have the issue in front of me.) He's a guy who's a large pain in the arse for everyone around him. He's always making reports to the police about dead people being on his property. The cops come over, and discover nothing. Then, he discovers another dead body, and the hilarity ensues. I don't know if the characters from "The KA" or "The Potentate" recur in other stories, or not. I hope they do. I will keep reading the Petrin stories I have. When I am done, I will schedule an interview with the man and see what makes him tick. I look forward to sharing that interview with you guys here on the blog. Let's see here. I have to get up extra early Monday morning to take my car to the shop. And I have one more full episode of Daredevil to watch. Go to bed? Or watch the last episode with Newbie? I don't need much sleep, anyway. Hi. 10:30 on Saturday night. I write these humble, slightly sub-par, even pathetic, words on my laptop, whilst in my recliner. The computer is on the right arm of the chair, while Newbie snores on my lap. Oh, to be a cat! I had a quick day trip to the Valley on Friday morning. I had made an appointment with an appliance repair place down there. I wanted them to check the washing machine down there. It was making a frightful noise, and I wanted to know why. After checking it out for 5 minutes, and refusing to accept any money for a service charge, I learned that there was a problem with the motor. Something was seized up somewhere, and the cost of fixing it would come close to the cost of purchasing a new washing machine. Good of him to be honest with me. I also went down there to deliver magazines to the retirement home where my mother lived, and where she also died, last year. They were taking up too much space in the kitchen. Plus, I had a whole bunch here in Halifax. Lugging them out to the car Friday morning nearly ruptured me. Lugging out the ones from the Valley kitchen was also great fun. And being told yesterday that they were now, because of me, in receipt of 5 years or so worth of magazines tells me that I got rid of them at a good time, and that I had better acquire no new ones. That's fine. I returned to the city in time for dinner. I had bought some victuals at Superstore in Bayer's Lake, and we ate some. And, as is usual with me, a trip to the Valley wore me out. I ended up turning in early. I woke up long enough to write last night's blog post and then turned in for the evening. This morning I went by myself to the Timberlea Beverage Room. The local MLA and city councillor, son and father in that order, had commandeered the place to have a community breakfast. Not a lot of food, but a nice thought. I don't know how many tax dollars went to pay for it. I went across the street to the local farmer's market. The bacon they had was something vile called "Bob's Bacon", on sale for $2.49 a package. I bought the package that looked the least disgusting, paid for it, and returned to the house, where I cooked some breakfast for Patricia, who is still convalescing. I spent the afternoon washing clothes, and hanging them up outside. They are frozen this evening. I have spent a number of hours this weekend watching episodes of season two of Daredevil. The whole season dropped on Netflix on Friday. It is even more violent than season one. It is even better than season one. I plan to be up for quite a while tonight watching more episodes. Well, assuming Newbie stops snoring long enough to let me. A very long day. Will tell you about it tomorrow. Didn't want to go two days with no posts so here's you are. Someone gave me this button a couple years ago. I could not resist doing this selfie on Wednesday. We had our bi-weekly Toastmasters meeting tonight. Club contests for Table Topics and International Speech. We had a participant in each, so we could actually hold a contest. We have had quite a few new members lately, so getting them involved in the process was good for them, and for those of us who have been around the block for a few years. Got home around 7:40. Patricia is feeling incrementally better every day. She asked me if she should return to work tomorrow, but I said she should take one more day. Friday is our day off, anyway; a quick day trip to the Valley should be a good test to see if she can handle returning to work on Monday. I plan to take an approximate crap ton of magazines and books to the retirement home where my mother lived the last going off. Their general manager keeps saying she would love to have as many as I can provide, and I can provide many. I guess I should call it a day. Long, busy day tomorrow. I ended up having to take a nap this evening. By 6:30 or so, I was nodding off, so I went down to my recliner and put my tootsies up and dozed off. Somewhere along the way, Newbie joined me, curling up on my lap and sleeping as well. Patricia is still improving. She asked me tonight if she should return to work on Wednesday. I told her no, that it should be a day-by-day thing. Maybe by Thursday, but likely not even then. My bi-weekly Toastmasters meeting is tomorrow. My goodness, those meetings come up quickly. I can retire in a few years, in theory if not in practice. At that time, I will have to decide whether to remain in the club I am in, transfer to one closer to my home, or leave TM altogether. I can't see myself driving downtown to go to a damn meeting every two weeks. I can barely see myself going downtown at all, unless it's to go to a concert or something. Maybe not even then. Be nice to be in that position where I can think about things like that, though. Finished reading another Jas. R. Petrin story today during my lunch hour. Only 24 or so to go. I will turn in relatively soon. I am still coughing a lot, but it pales before Patricia's lung lunges. She remains off work. We are hoping that maybe she can return to work on Wednesday, but we are not taking bets. When I got home from work today, Patricia had cut up some veggies in anticipation of preparing a stir fry. I ended up cooking the strips of beef, and supervised the cooking of the rice. After the meat was cooked, which only took a few minutes because you don't want to overcook beef strips either, I put the beef in a container to rest before cooking the veggies. When they were about done, I added the beef and the sauce for a few minutes. Then, we had a delicious beef stirfry for dinner. Better than any restaurant. Why eat out, spending all that $, when you can stay in and have a very good meal using ingredients already in the house? I exchanged another email with crime fiction writer Jas. R. Petrin. He gave me some insights into his writing process. I very much look forward to meeting with him when the weather improves, and after I have read all of the Petrin stories I have in my collection. I really think that you guys will enjoy reading about him, even if you haven't read any of his fine stories. I think I will conclude my evening by reading a Petrin story. You guys have a good evening, and I will talk at ya tomorrow. I'm still coughing up a lung. It's not my good lung, so I consider myself lucky. Patricia is still slowly on the mend. She keeps asking me if she should return to work tomorrow. I still laugh at her and remind her that she still has what she has, and that she has no business returning to work until it's better. She remains on two different types of powerful meds that have unfun side effects. Trust me. They don't want her back to work until she's over this problem. We had an otherwise good day. I cooked haddock for dinner. It is the same recipe my mother taught me a very long time ago. You take the pieces of fish and roll them around in flour before dipping them in an egg mixture before putting the rolled-and-dipped fish in the frying pan. The fish is done as soon as it starts to flake. The worst thing you can do with fish is overcook it. When you even suspect it is done, it probably is. Put it on a plate with all the other fish you're cooling, and serve with a smile. Hardly difficult. If I can do it, then anybody can. I'm not putting myself down. I am just telling the truth. This recipe is impossible to frig up. Anyway, Patricia told me about 6 times that she loved the fish. We watched some of the Canadian Screen Awards tonight. If you were wondering what became of Norm Macdonald, he's reduced to hosting Canadian movie and tv show awards. The lifetime achievement award went to Martin Short. I have never "got" Martin Short. If he has ever said or done anything funny, or droll, or clever, or just non-stupid, then I haven't seen it. I can think of a supporting role he had on a long-ago tv show called The Associates, and I liked him in that. When he was pretending to be buffeted around by a wind machine last year on an SNL special, I chuckled. That's about it. But people think he's a comedic genius of some kind. I don't know why. On that negative note, I will turn in. PS. I did not misspell Norm's last name. The d is in lower case. There are clans of MacDonald's where that d remains in lower case. What it signifies, I do not know, other than the fact they want the d to remain in lower case. In the 1940's and '50's, Nova Scotia had as its premier Angus L. Macdonald. We named the old bridge in Halifax after him, but he did not live to see its completion. It vexes me when people capitalize the d in the bridge name. And... there you have it. Well, Patricia is slowly on the mend. And, my coughing is continuing at a nice rate. Lovely day, in other words. Say, you ever see that show starring Dominic Monaghan, one of the guys from "Lost" and the Lord of the Rings movies? He travels all over the world looking for rare and exotic animals, like electric eels, the white lion, and the (ahem!) Lake Titicaca water frog. We watched a few of those shows on the pvr tonight, and had a great time. You should check it out. But, whatever his camera man, Frank, gets paid, it is not enough. Not by half. Patricia has gone to bed for the evening. I think I will sit in my recliner for a while, seeing what mischief I can find on Netflix. Have a good evening, and I will talk at ya tomorrow. Post 3208 - And... Furthermore! I have a natural part in my hair. I do not recall a time when it was not there. It is on the top left of my head, just up and over from my eye. Straight as a line. For the last couple of weeks, I have been unable to find it, and I blame the woman who cut my hair last month. A chirpy thing, complaining about her boyfriend and discussing in non-stop detail what a louse he was, and how she was better off without him, but she missed his cat; she had left him in the Valley where she had been commuting to the Halifax every morning, but was now ensconced in an apartment in town with her own cat. Along the way, I became so bored and fed up with her mouth, and disappointed with the quality of the hack work she was doing to my lovely hair, that I declined her generous offer of washing my follicles afterward. I hurriedly paid her, bought the tea tree oil hair products I prefer, and got the H out of there. You know, when you get your hair done, how you can never quite recapture what was done that magical day? Try as you might, it cannot be done? Well, I have a similar-yet-opposite problem. Since that morning, I have lost my hair part. Nothing I can do to my hair, no amount of combing, or product, or anything else, lets me get my hair in a way that I find suitable, and the natural part I have had my whole life has gone off to... parts unknown. It looks like one of William Shatner's hairpieces from back in the day before he could afford the really nice ones. Damn that woman, whose name I will not give out for fear that it might cause me to get a visit from the police. Damn her. Damn her all to H.
I have gone to this hairplace many times over the years. The visit in December was quite nice, and I used pictures from that visit on the blog for one of my Christmas Tie Extravaganza days. But, now, I can't go back there. The place is forever tainted, stained, contaminated in my heart. So, for Halifax readers only: Where can I go henceforth to get my haircuts? Not that place on Kempt Road. Other places, within walk of my work on Young Street, if possible. I feel so much better, discussing this. It has been a burden to me, to have hair that is less than beautiful. To have hair that is merely human. Hello again, my lovelies. How are you this evening? I recently decided to make a change. I have made it, and it is working fine. So, I will tell you about it. I no longer use those crazy-arse expensive razor blades. You know, the Proglide things that have 17 blades on them to give you the closest.shave.ever! I got a great shave there that day. There was no Gillette Proglide, 17 blade blah blah blah to be had there. Why not? I still had a supply of those expensive blades, so I have been using them dutifully. I would shave, wash the razor, thoroughly dry the thing, in order to keep it lasting longer than it would have had I not. Finally, in recent weeks, I have found that these blades were becoming less and less effective, ripping at the whiskers rather than gently scraping them away. I did not want to spend 50 dollars or more on another set of those expensive blades. I distinctly remember him using Wilkinson Sword blades. This worked fine for Dad for many years. In the 1980's, he moved over to disposable razors. They worked fine for both of us for some time. But I eventually found that these disposable things did an increasingly-poor job on my face, ripping my skin rather than shaving it, causing more than a few cuts and knicks and blood letting sessions. That's why I moved to the expensive blades quite a few years ago. I think Dad kept muddling along with the cheap blades until I started buying him the expensive Gillette ones that I used. He loved them, and I made sure he had a steady supply of them as presents for Christmas and his birthday. I figured, if the straight razor is good enough for Sailor Bup's, why can't a regular safety razor similar to what Dad had decades ago, be good enough for me, now? Well, it was easier to say that than do it. Those safety razors are not that easy to find anymore. The profit is clearly with the Gillette Proglide variety. And it was also not that easy to find the razor blades like you see in the above picture. I ended up looking on Amazon and ordered a Lord safety razor. It came with a "starter pack" or 5 razor blades. It came on Monday, and I tried it out for the first time Monday night, after my shower. The razor had a good "heft", and felt good and natural in my hand, while I went to work. It took a few minutes, but I developed the kind of routine and pattern conducive to a good shave. I had to press a bit harder against my skin than I did with the Proglide razors. The whiskers that were about a week old, came off very nicely. My face felt smooth and clean. And, I had not cut myself. I had another shower and a shave last evening. Once again, there were no cuts. My face felt smooth and Patricia pronounced that I looked great. And I am happy with my purchase, despite the typo's on the packaging that made me think I had got a knockoff product. I have had two good shaves so far. I still wash the razor after each use and make sure it is dry, too, to prevent blade rust, which destroys the sharpness of the blade. Patricia was a little miffed that I had not asked her to buy me this razor for my birthday or something. I told her that she could buy me a better quality razor for Christmas, one that used these razor blades, but which has more heft again, or perhaps a few more features, such as a "butterfly" aspect that makes it easier to replace the blades. I will leave that to her. I am still using the first blade. 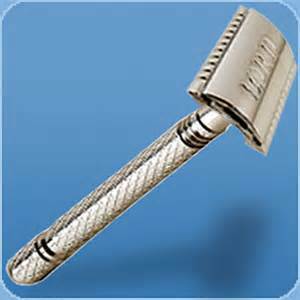 Four left, so I have plenty of time either to source a local place that sells these razor blades, or order them online. If you have any suggestions, I am open to them. I am not sure how much you care about this stuff, but I do. I like to save money, and I think I will with this purchase, while also getting good, close shaves. 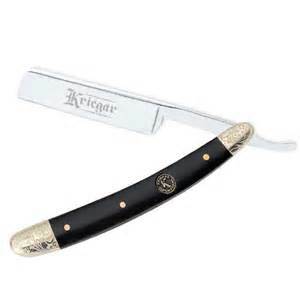 Once you get over the cost of the razor, the blades are very inexpensive. What kind of deals have you found for yourself over the years? Post 3206 - I'm Back! I am a crazy little fella known as Bevboy. I have this here blog, which I began in 2007 and which has over 3200 posts. My goal was to write something every day. A few years ago, my now-deceased mother required surgery in her neck, to preempt a potential stroke. She was 79 at the time and had a host of other issues. I was granted some time off work to deal with the stress of her surgery and be there for her when she came through the other side, assuming she survived the surgery. I blogged as normal. I wrote about this, and that, and everything else. I tweeted like a son of a gun. I shared things on Facebook. It was a way, once again, to give me a sense of balance and normalcy. When I got back to work, I was asked why I had had such a high profile while I was off. When you have these days off with pay, you're supposed to keep things quiet and not really draw attention to yourself. I felt chastened, even foolish, and promised not to let it happen again. I developed a policy after that, that when I took a sick day, or some family illness days, something like that, that I would not produce a blog post that day. I do find myself sharing funny pictures on my Facebook timeline on these days, and maybe I shouldn't; but blog posts, in my opinion, and in that of others, should not happen. And they won't. That's why you haven't seen a blog post for a week. Patricia took pretty sick last week. I won't get into the details here, other than to say she is steadily recovering, but still not back to work. I plan to take her to her doctor's on Friday to see what's up, or whether additional meds will be required to vanquish this malady once and for all. I thought my place was with her. Maybe I was wrong. Hard to say. Depends on what type of human being you are, I guess, which side you would take. But at any rate, I caught some kind of flu on Friday, a virus of some kind, and it knocked me on me arse all weekend. It was only on Tuesday that I felt relatively normal again. I returned to work today, which is why you are seeing this blog post. I felt well enough yesterday to make a shepherd's pie from scratch. Valley roast beef as the base, with mushrooms and veggies and topped off with mashed potatoes. Tasted even better today when I had a nice slab of it for lunch. Do you hate me? Oh, here's something neat. I have been writing about Jas. 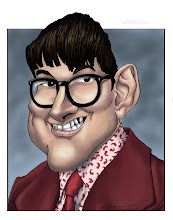 R. Petrin, the Nova Scotia based crime fiction author who's had dozens of stories published in Alfred Hitchcock's Mystery Magazine (AHMM) over the last 30 years. I have been trying to track him down. He wasn't registered with the Writer's Federation of Nova Scotia and I could see no variation of his name on Facebook. I wrote the editors through the AHMM website, but heard nothing. I finally decided last week to put a message on the AHMM Facebook page, in the hope that the editors might see it and throw me a bone. They wrote me yesterday, and asked me to send them a private message with my contact information. I did. They wrote me back and promised to pass along that information to Mr. Petrin. This morning, shortly before I went to work, my smartphone informed me that I had a new email. I opened it up, and it was from Jas. R. Petrin himself! He has agreed to an interview. He has given me his home address, which is along the French Shore of the province. I can't remember the last time I was there, and now Patricia and I have an invitation to go to Mr. Petrin's house and discuss his career as a writer. I am very much looking forward to it. Just waiting to read through the Petrin stories I have so I can take notes and use them in my interview. And, to be extra nice, Mr. Petrin sent me a Word document containing every known story he has written over the last 31 years. I now know that his first story for AHMM was in '85, and NOT '86 as I had thought. I am aware of about 10 more Petrin stories today than I was, yesterday. This will be the first Jas. R. Petrin interview I am aware of. He has little quotations here and there if you google his name. There is a brief piece he wrote a few years ago about the creation of his Skig Skorzeny, but that's about it. I will make sure that Petrin fans everywhere know about this interview once it's done. I'm so excited. And, I'm so excited to be back. I've missed writing this blog every day. From what I gather, my 4.7 readers did, too. I treated myself to breakfast this morning, at the Ardmore Tearoom on Quinpool Road. Patricia had medical appointments today in Dartmouth, which meant she had to take the day off. Anyway, I got my usual French Toast from that fine eating establishment. It is actual bread, nothing fancy, fried in an egg and milk mixture, and served to perfection, for 6 dollars. Add a bottomless cup of coffee for 2 bucks, and you had a pretty decent meal. 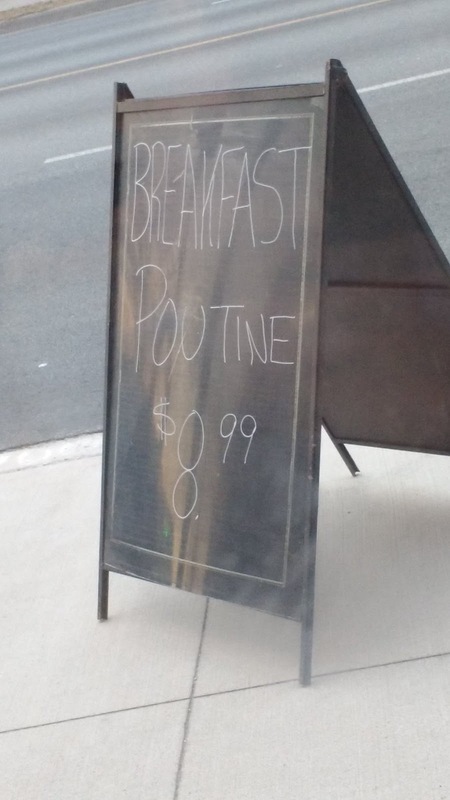 Breakfast poutine, served at the Ardmore, for that price. The server told me what was in it. It's a big bowl, full of hashbrowns, bacon, sausage, cheese curds; and then the insanity is smothered in hollandaise sauce. I think they also supply a lawyer who specializes in last wills and testaments, just in case the diner feels a twinge of guilt (or heart pain) and decides to make sure that things are nice and legal if he kicks off during the eating of this food. I am not saying I would never eat something like that. 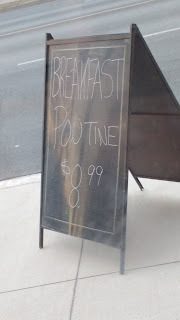 I am saying that I would have had to eat nothing for a couple of days and be ten times more depressed than I am by default, before I would consider ordering breakfast poutine. This has got me to thinking, which scares me a little, because I don't think much. What is the most... interesting thing you have ordered on a breakfast menu? Something you know you should not have eaten, but did, anyway? Contact me via email, via a comment on this blog post, via reply on my twitter, or via a Facebook comment. Have spent the last couple of hours configuring download clients and so on. I went back to usenet-based downloads this evening. There is always some stupid thing that holds me back, that confounds me, that makes me stumble. But based upon an example of something else, I decided to try one last thing, and it is now working. Once again, I have proved that I am the superior being over this machine. A fellow at work showed me a way I could get a much cheaper membership to newshosting.com than what I had last year. Now, I have it again, and it is working. Hah! Do you know what I'm referring to? Too bad. Not going to explain it, because I'm so smart and all.